Snapchat launched Spectacles, a pair of sunglasses in the year 2017. The Spectacles come with a camera and are similar to GoPro but are for the face. Video snippets can be recorded and saved on Snapchat memories. The camera in the spectacles comes with 11 degree lens. Creators and marketers are using spectacles for their business purposes. Snapchat Spectacles for Business is explained here. 1. Hands-free video recording helps the brands to record things from their point of view. 2. Snapchat spectacles are especially useful to live stream events. 3. Brands can create behind the scenes videos and introduce things to their followers. 4. How to videos can be created showing how to use their own products. 5. Record interviews of customers or persons related to the business. 7. Since the spectacles come with 115 degree lens, circular video can be created by real estate, automobile, travel and tourism and other promotions. 8. Snapchat spectacles will give more than ideal options of ideography for brands that create demo videos or unboxing videos. 9. Using a web cam for demo videos results in low quality image but this is not the case when using Snapchat spectacles. 10. The videos created with Snapchat spectacles can be posted on Snapchat to get more views and engagement. 11. Brands can encourage their customers to generate spectacles content. 12. First experience location shots can be shot and shared with the followers. 13. Take the interview of the satisfied customers and use these videos to promote the product or service as customers trust the testimonial videos. 14. Keep the audience engaged by showing them how the product is made. Create these videos with Snapchat spectacles. 15. When reviewing products, shooting with Snapchat spectacles help in making the video appear closer. 16. Brands can shoot their exclusive events and show them to the followers. 17. Make some official from the company answer or clear the questions and doubts of prospective customers about the product. 18. Snapchat spectacles will be of great help to record quick Business videos. 19. Inform the followers about new launches by introducing the product through a video created with Snapchat spectacles. 20. Share breaking news of the company. 21. Create some exclusive videos with Snapchat and show them to followers. The content should not be available to them on any other platform. 22. Short video clips of around 30 seconds can be created using Snapchat spectacles. After ten minutes the recording will be automatically stopped. Tap again and add another ten seconds of video and then again tap and increment 10 seconds. 23. While shooting Business Videos with Snapchat spectacles and sharing it on Snapchat, take care that the videos are not lengthy. 24. Create videos of not more than two minute duration of the special event to keep the audience engaged. 25. Ask the influencers or celebs to take over the Snapchat account for one day and post video created by Snapchat spectacles. 26. Doing Social media marketing with Snapchat spectacles in the present scenario is to make the brand personal. 27. Wear you Snapchat spectacles and take your followers with you to the exclusive events of the company, inside your company etc. 28. Use Snapchat spectacles to control how the followers see your brand. 29. If you are a hair stylist or have a hair salon, show the followers how to do hair styles, create brain pattern etc with the help of Snapchat spectacles. 30. Real Estate businesses can show the guided walkthrough of homes, apartments etc for sale to their prospective customers. 31. Creating Tour guides with Snapchat spectacles can show interesting places and tourist attractions to their followers. 32. Teach the followers prepare perfect martini by creating video with the Snapchat spectacles. 33. People in the massage business can show how to do workouts and stretches correctly. 34. People in the entertainment industry can use Snapchat spectacles to great advantage. 35. By using Snapchat spectacles take the audience through the experience of using your latest products. 36. People love to see exclusive content. Fashion brands can use Snapchat spectacles to create sneak peeks. 37. Snapchat can be used to drive boost traffic to your business events. The fun event can be created with the spectacles. 38. Encourage your followers to submit user generated content using spectacles and offer those discounts, freebies etc to them. 39. Offer discount coupons to the followers through Snapchat. 40. Do first person recording and share them on Snapchat. 41. Have your customers film your business space with Snapchat Spectacles and share the positive experience. 42. Snapchat spectacles stealth factor could be used by media journalists. 43. Hospitals can use Snapchat spectacles to record surgeries. 44. Sports teams are also using Snapchat spectacles to show the close look at the game. 45. Use Snapchat Spectacles to live stream discussions, product launches etc. 46. Encourage followers to join the live streaming and get answers to their questions from experts. 47. Snapchat spectacles can be used by brands to allow potential customers to see more about the brand. 48. Use them to create videos, commercial, make announcements etc. 49. Experiment with Snapchat spectacles and discover what works for your brand. 50. Use Snapchat spectacles for personal branding. 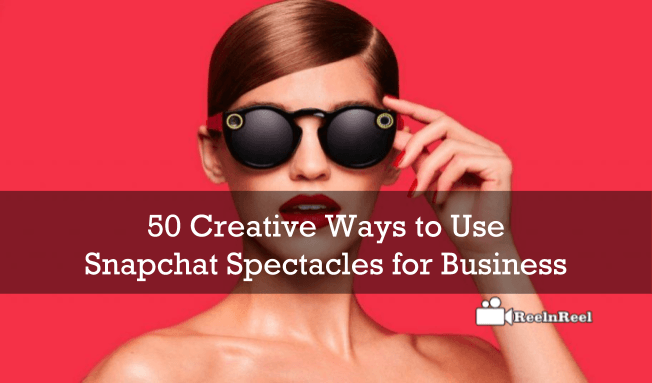 There are hundreds of ways brands and businesses can use Snapchat Spectacles for Business to engage with the customers.